As tourists wheeled their suitcases through the afternoon rush in Moscow’s Arbatskaya Metro station, a worker frenetically scraped and peeled back the adhesive patches that had directed World Cup fans to Luzhniki Stadium for the previous month and threw them into a trash bag. 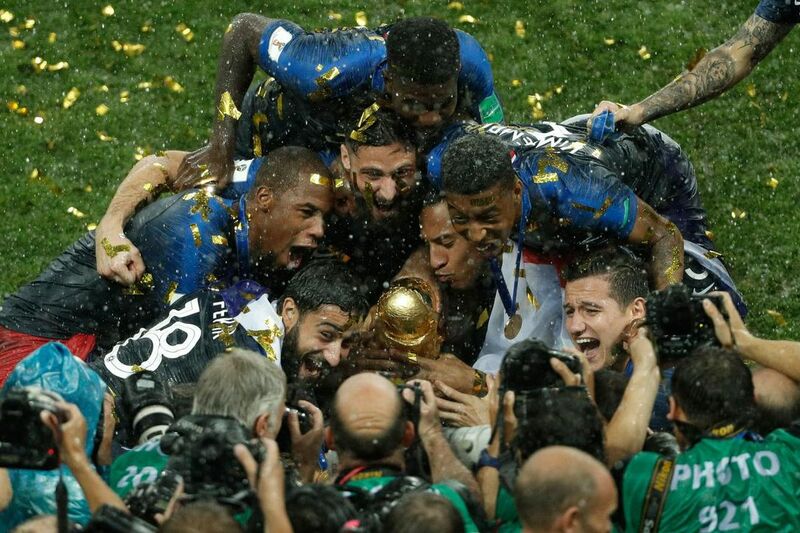 It was Monday afternoon and the 2018 World Cup had wrapped up the night before with France crowned world champion for a second time. A week is a long time in soccer and the sport has rapidly moved on from the month-long carnival in Russia to focus on the mega transfer deals and pre-season preparations of Europe’s biggest clubs. The debate that raged over whether Russia 2018 could be considered the greatest World Cup appeared to fall down on the fact that it didn’t feature a truly great team. As good as the French were — and they were a wholly worthy champion — the triumph of Didier Deschamps’ side was centred on a contained collectivism. Their most creative and dynamic players reined in their natural instincts for the greater good and their reward was the greatest prize of all. That was in keeping with a tournament that saw collective approaches come to the fore. While France’s mutual efforts saw it play within itself, the tournament’s other prominent sides banded together to drain every last drop out of cumulative talents. Croatia went further than ever by being more united than ever. Ditto Gareth Southgate’s new England, whose belief in and execution of the management team’s set-piece-heavy approach reaped the first semifinal place in three decades. Belgium’s golden generation had their best result and finest performance — the quarterfinal victory over Brazil —by being more cohesive than ever. Host Russia and Sweden prospered as co-operatives. On the flip side, teams that were built on top of one or two stars floundered: Argentina crumbling in on Lionel Messi; Portugal only going as far as Cristiano Ronaldo could carry it; Poland, Egypt and others never making it out of the blocks as they were too focused on one leading light. As Canada builds for the future, teenage phenom Alphonso Davies is becoming a truly generational talent. How Herdman harnesses him will go a long way to deciding how successful he is in the job. Building around and through Davies, rather than on top of him, would be best advised. In many areas, the distance between the best and the rest continues to shrink apace. That was already evident in qualifying for this tournament when giants such as Italy and the Netherlands never even made it. Yes, France’s victory can be seen as a win for the industrialization of talent production. But coaching and sports science are helping narrow other gaps. Herdman is an analytics and research fiend. He must surely have noted how his homeland in particular weaponized the set piece in Russia. International soccer always leaves coaches short on time, but innovative free kicks and corners are something that can be drilled down quickly. Bigger picture approaches take time, but the death of tiki-taka and Germany’s own version of it should be seen as signals, too. Canadian progress could likely come much quicker by adopting parts of Uruguay’s Atletico-lite approach: soaking, countering and capitalizing on errors. Herdman spoke this past week of short- and long-term plans stretching all the way to 2026 when Canada will be a joint host of the greatest show on earth. All sounded ambitious. He pointed to the new CONCACAF Nations League and the path to the Gold Cup as a journey that fans can get behind, but so too for young players choosing between Canada and other countries. “A big part of our success will be if we hold on to those dual passport players,” the coach said. As an immigrant himself, Herdman should be scouring the Canadian diaspora like never before. Morocco returned to the world stage in Russia for the first time in 20 years with a squad containing just four homegrown players. Tunisia was similarly boosted by talent brought in after eligibility searches across Europe. Unearthing Canadian-qualified talent already thriving in Europe would be a huge boost. Holding on to it, even more crucial. Canada, so short on solid young defensive players, lost Chelsea’s Fikayo Tomori to England and saw him lift the under-20 World Cup with them last summer. In the wake of the World Cup final, Ireland manager Martin O’Neill was asked what that country could learn from Croatia — a nation of just over 4 million — making it so far? His first observation was how important it is to have players playing at the top level in Europe. Similarly, after his country’s exit to Brazil, Mexico’s Juan Carlos Osorio spoke of the need to get more players at the big clubs across the Atlantic. Canada has a dearth of such players, with too many operating in the half light rather than the limelight, but hope springs. Davies is reportedly being scouted by Bayern Munich, Manchester United and a clutch of other Champions League heavyweights. Cyle Larin is preparing for his first full season with Besiktas in Turkey. Junior Hoilett will be back in the English Premier League this season. Recently capped teenager Liam Millar has excelled for Liverpool’s development squad domestically and in continental competition. Having more young players rise and thrive in Europe would go a long way to helping Canada’s cause.